Yes, the DCS-6112 and DCS-6113 both supports CIFS (Common Internet File System). Step 1: Log into the web-based configuration of the camera. Step 2: Click on Setup icon on the top left corner. Step 3: Go to Advanced Setup -> Event Management -> Event Settings. 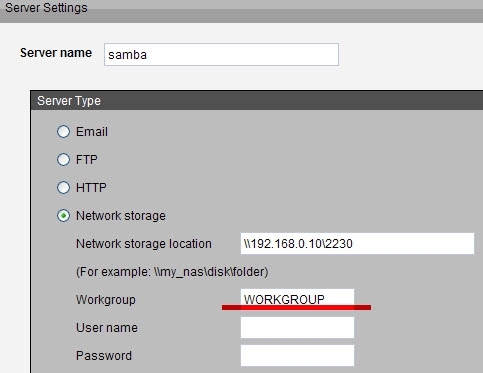 Step 5: Select Network Storage option, add a "Network storage" setting, and the Workgroup field must be filled. Step 6: Click Save button to save the new settings.